In the Twin Cities and around the country, Agile and Scrum methodologies are the newest career trends that are not new trends. The Agile Manifesto was actually written almost 20 years ago by like-minded software practitioners, and time has proven that the agile methodology can and does apply to any type of project. How can you add this skill to your resume? Agile training can include professional development certifications and certificates or continuing education courses; even PMI® has now added the Agile Certified Practitioner or PMI-ACP. Let the Institute for Professional Development in St Paul help guide you and your company into this rewarding and lucrative career. An offshoot of Agile is Scrum. Scrum is a set of principles and practices that aid in the execution and delivery of projects. 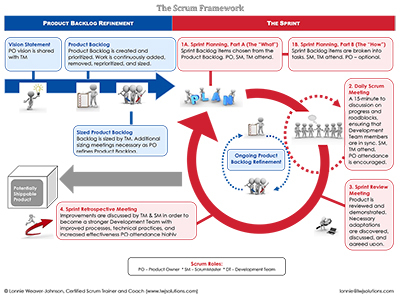 Although Scrum has also been viewed as a technique for software development, other products can also be developed using Scrum. Scrum courses and training now exist for you to earn designations such as Certified ScrumMaster® and Certifed Product Owner®. With so many advantages it is puzzling why more businesses do not use this transformation methodology. You need to know the right time to use Agile and Scrum – some projects still work best with waterfall project techniques, so you need to choose wisely. One bad Agile or Scrum project may cause business leaders to abandon the practice. • For those who are advanced, we offer targeted courses in user-story and testing. Please call if you need assistance in selecting the course that will improve your Agile and Scrum skills.